Exotic Coconut Face and Body Lotion - Escape to the island with this scent of tropical sexiness! Moisturize your skin with delicious cocoa butter and sweet almond oil - great for dry skin! Ingredients: distilled water, sweet almond oil, emulsifying wax, cocoa butter, stearic acid, tocepherol (vitamin E), fragrance, phenoxyethanol, caprylyl glycol. 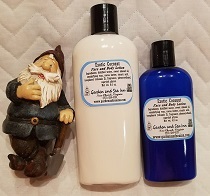 Light n Lovely Lavender Face and Body Lotion - A light and silky lotion made with lavender essential oil. Excellent for moisturizing all-year round. Lavender essential oil is used for inflammations, wounds, eczema, dermatitis, headaches, insomnia, tension, acne, and bacterial conditions just to name a few. 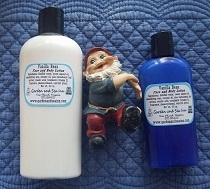 No formaldehyde, no parabens, no sodium laurel sulfates, no phthalates. 99% All-Natural. Ingredients: distilled water, grapeseed oil, emulsifying wax, sweet almond oil, apricot kernel oil, cocoa butter, peach kernel oil, lavender essential oil, tocepherol (vitamin E), stearic acid, phenoxyethanol, caprylyl glycol. 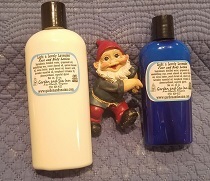 Vanilla Bean Face and Body Lotion - A sweet sugary aroma of fresh vanilla beans. Made with aloe butter! Ingredients: distilled water, sweet almond oil, emulsifying wax, coconut oil, aloe barbadensis leaf extract, stearic acid, tocepherol (vitamin E), fragrance, phenoxyethanol, caprylyl glycol.